The Amici Orchestra was founded in 1998. Originally a string chamber orchestra, it has expanded over the years in order to accommodate a wider variety of repertoire, from the classical and romantic periods through to Film Music Spectaculars! The players that form the orchestra come from a variety of backgrounds including; ex- Bromley Youth Chamber Orchestra and ex- Bromley Youth Concert Band, ex – Royal Academy , Royal College, Guildhall and Trinity College of Music, The Whitehall Orchestra, Kensington Symphony Orchestra, Imperial College Operatic Society and many more. Concerts are always put on after only 1 day of full rehearsal – demonstrating the talent and professionalism of those involved. Net proceeds from all of our concerts are always given to charitable causes. Past concerts have raised substantial funds for The RNLI, The Prince’s Trust, The Royal British Legion, Queen Alexandra Hospital Home, Macmillan Cancer Support, Breast Cancer Campaign, The British Heart Foundation and Centrepoint. 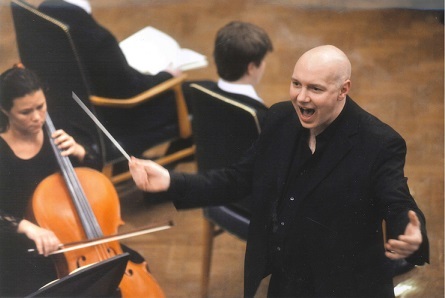 Simon Walton enjoys a highly successful and varied career as a performer, teacher, conductor/director and coach. A former principal flute with the National Youth Orchestra of Great Britain, he began his concerto career at the age of 14 with the Nielsen concerto, and continued, whilst still at school, to perform much of the flute concerto repertoire with a variety of orchestras around the country. He continued his studies at Manchester University, where he won several performance and academic prizes, and as a postgraduate at the Guildhall School of Music and Drama. Whilst continuing his post-graduate studies, Simon started his professional singing career in London’s leading churches, including Westminster Abbey and the Brompton Oratory, with which he has recorded and broadcast for the BBC. In 1996 he made his operatic debut in the role of Luigi (Il Tabarro). Other principal roles performed have included Turrido (Cavalleria Rusticana), Edgardo (Lucia di Lammermoor), Macduff (Macbeth), Loge (Das Rheingold), Samson (Samson et Dalilah) and Florestan (Fidelio). Simon has appeared and recorded with Kent Nagano and the Opéra de Lyon and Claudio Abbado and the Berliner Philharmoniker. Oratorio performances have included Verdi’s Requiem, Puccini’s Messa di Gloria and Mendelssohn’s Elijah. In 2006 he was invited to create the role of Frank Troy in the premiere of a new opera Far from the Madding Crowd by Andrew Downes, commissioned by the Hardy Society. In a broader musical context Simon has worked as a professional accompanist on the piano, an instrument on which he has also recorded Saint-Saëns’ Septet and performed Rachmaninov’s 2nd Piano Concerto. He has given flute and singing masterclasses in this country and taken a choral workshop with the Wesleyan University Musicum Collegium in Connecticut USA. For the last six years, Simon has been invited to be a member of the senior coaching staff on the residential Grittleton Chamber Music Course for adults. In 1993 Simon was invited to write Young Musician Plays Flute (Watts Aladdin Books, London) as part of their education series, a flute teaching book which has since been translated into several languages. Zara Wright has been playing the violin from the age of seven. She has been the leader of both the internationally award-winning Bromley Youth Chamber Orchestra and the Bromley Youth Symphony Orchestra. Zara studied Music at Queen’s College, Oxford where she performed in numerous concerts as both soloist and in ensembles, and was co-Leader of the Oxford University Orchestra. She was also involved in choral music, singing with Schola Cantorum of Oxford and holding a choral bursary at Queen’s. Zara currently plays occasional recitals around the country and also sings regularly with the Cambridge Taverner Singers and the Duomo Singers. 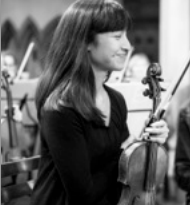 Zara is currently the deputy leader of the Whitehall Orchestra and has led the Amici Orchestra since its formation.